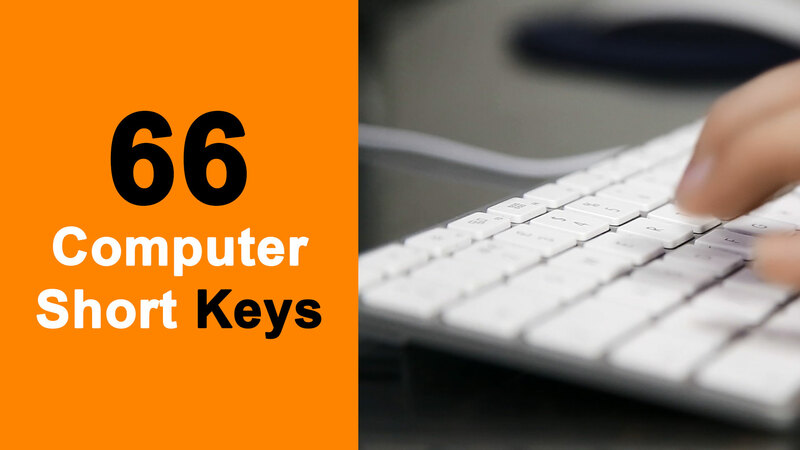 Different short-cut keys can frequently be used while working on the Computer. Here we made a list for help the user to save time while working on computer. Users should memorize all of these shortcut keys to save his valuable time. Computer Commonly used shortcut keys. Number 1: If you press Home Button it takes to you at the beginning of the current line. Number 2: If you press End Button it takes to you at the end of the current line. Number 3: Ctrl Plus Home Button takes to you at the beginning of the document. Number 4: Ctrl Plus End Button takes to you at the end of the document. Number 5: Shift Plus Home Button can Highlights from the current place to the beginning of line. Number 6: Shift Plus End Button can Highlights from the current place to the end of line. Number 7: Esc Button use for Cancels a selection. Number 8: F1 Button use for Universal help for any sort of program. Number 9: F2 Button use for Renames the selected icon. Number 10: F3 Button use for Start find from desktop. Number 11: F4 Button use for Opens the drive selection when browsing. Number 12: F5 Button use for Refreshes contents. Number 13: Ctrl Plus A Button will Selects all text in current program. Number 14: Ctrl Plus X Button will Cuts the selected item in current program. Number 15: Ctrl Plus C Button will Copies the selected item in current program. Number 16: Ctrl Plus Ins Button will Copies the selected item in current program. Number 17: Ctrl Plus V Button will Pastes copied item in current program. Number 18: Ctrl Plus Z Button will Undo a change in current program. Number 19: Ctrl Plus Y Button will Redo a change in current program. Number 20: Ctrl Plus N Button will Starts a new note. Number 21: Ctrl Plus O Button will Opens a recently used note. Number 22: Ctrl Plus S Button will Saves changes to a note. Number 23: Ctrl Plus P Button will Prints a note. Number 24: Ctrl Plus F4 Button Closes window in program. Number 25: Ctrl Plus F Button Start a search tool. Number 26: Ctrl Plus (+) Key use for zoom in when working on web browser. Number 27: Ctrl Plus (-) Key use for zoom out when working on web browser. Number 28: Ctrl Plus (0) Key bring to you at actual size when working on web browser. Number 29: Ctrl Plus Alt Plus Del Button will Opens windows task manager. Number 30: Ctrl Plus Esc Button will Brings up start menu. Number 31: Ctrl Plus Left arrow Moves one word to the left at a time. Number 32: Ctrl Plus Right arrow Moves one word to the right at a time. Number 33: Alt Plus F Button use to open File menu options in current program. Number 34: Alt Plus E Button use to open Edit menu options in current program. Number 35: Alt Plus F4 Button use to Closes current open program. Number 36: Alt Plus Tab Button use to Switche from one open application to another open application. Number 37: Alt Plus Shift Plus Tab Button use to Switche backwards between open applications. Number 38: Alt Plus Print Screen Button will Creates screen shot for current program. Number 39: Alt Plus Esc Button use to Switche between applications on taskbar. Number 40: Shift Plus F10 Button Simulates right-click on selected item. Number 41: Shift Plus Del Button use to Deletes selected programs/files permanently. Number 42: Shif Plus Ins Button will Pastes copied item in current program. Number 43: Shift Plus Home Highlights from current position to the beginning of a line. Number 44: Shift Plus End Highlights from current position to end of a line.